There are plenty of apps, services and websites dedicated to helping you make notes, write lists and share snippets of content. However, the thing we love most about services like Pinterest, ffffound and We Heart It (and we do love them) is that they’re focused on visual content, whether that be an illustration, photo or diagram. Maybe we’re just all visual learners or something here at Shiny Shiny, but keeping a photo with a note attached to it just seems to make more sense than a lengthy chunk of text. GetVega is a little different, because it seems more serious and organised than the likes of Pinterest, but it still scores well with the visual lovers because you can make lists with photos and images. 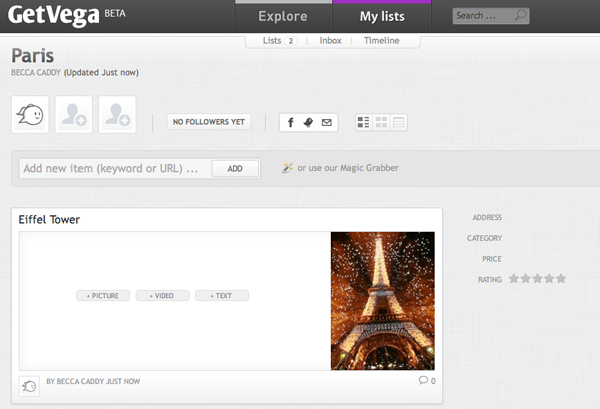 You simply create a list, which you can make public or private, then set about adding links to those lists. If you link to a blog post with a photo in it the photo will pop up along with the text, which you can then amend accordingly. You can also add images manually too and the thing that makes it a winner in our eyes is you can add a “magic grabber” to your browser so you can easily save photos you come across to a list, which will make you so much more likely to use it in the long run. Just like Pinterest you can be the sole contributor, or you can add others too, which makes it great for collaboration with friends and even in the future businesses who sell items and depend heavily on lovely imagery. Who’s going to love GetVega? People who like to keep things organised and neat but love big beautiful images. If you found Pinterest a bit too crafty give this a go and if you’ve never signed up for a curation and visual inspiration tool then get one now, it should be one of your social media resolutions after all!